Huada Glassware is made of medical grade Borosilicate glass that is light and strong. It may feel thin, but it's much stronger and more durable than common glass. Borosilicate glass is a type of glass with silica and boron oxide. Very low coefficient of thermal expansion, resistant to thermal shock. *Lightweight: Borosilicate glass is less dense than ordinary glass. That makes it lighter in weight. *Heat Resistant: Withstanding Temperature differentia 165°C/329°F (Common glass only 37°C/99°F). 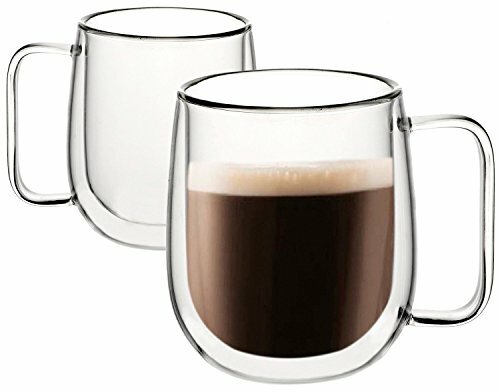 Perfectly safe for ice drink and hot espresso coffee or tea. *Heat Preservation: 2-layer design insure that their contents remain hot for longer while the glass itself remains only warm to touch. It also prevents condensation. *More Safty: Huada coffee cup is FDA approved, Non-toxic, Easy clean. 3.A small spot on the bottom of cup? For the safety of users, it's not vaccum between the 2 layer of mug. To prevent glass pieces blow up and do damage to human when break, our new design mug leave air inside. Don't scrub the sealed air hole strongly in washing. A. We do not suggest dishwasher, please consider hand washing in flowing water. B. Avoid microwave or oven, because of the air inside as mentioned above. We're so confident in the quality of product. FULL Refund or Replacement will be offered if you're not 100% satisfied. Click the yellow "Add To Cart" button now to lock in the lowest possible price. If you have any questions about this product by Huada, contact us by completing and submitting the form below. If you are looking for a specif part number, please include it with your message.